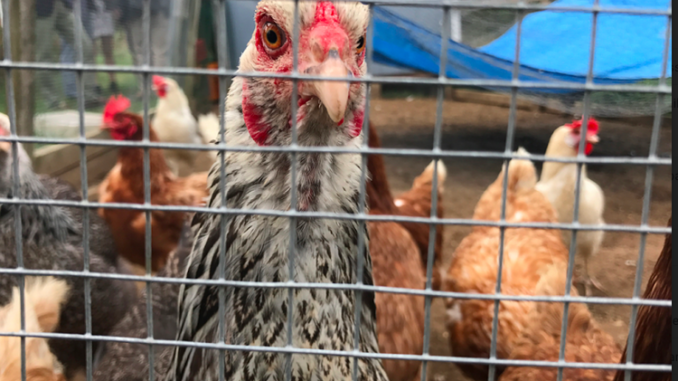 With the Chicken Keepers Club in its third year of operation, club advisor Mr. Danenbarger can state with certainty that the club’s finances has not “laid an egg”. Money from the sale of the eggs goes towards the purchase of the feed and other supplies, while members of the club perform the labor. Chores include gathering the eggs, changing the hay, feeding the chickens, providing fresh water, and letting them out in the morning and back in at night. There are currently 17 members in the club. “Duties also include delivering egg subscriptions and managing money,” said Eli Taylor ’19. At least two chickens have fallen victim to hawks. But so far, at any rate, the chickens have escaped capture from the resident foxes on campus that have not been successful making their way into the hen house. “We don’t let the chickens out at night, and now there’s a top on the outdoor area,” said Eli. Mr. Danenbarger, one of the faculty advisors, has expressed interest in replacing the chickens they have lost. Currently, the remaining chickens are working at their maximum capacity. In fact, the egg program has become so popular there’s a waiting list for people wanting their farm fresh eggs. The club has about 22 hens, and since each hen produces roughly one egg per day, the club usually gets close to 20 eggs per day. The demand for these eggs are high, and sell out every week through a subscription service that is offered to faculty and staff. After the initial investment from the school, which was partially funded by offering eggs at the School Auction run by the Advancement Office, the club sustains itself by selling the eggs the chickens lay. “We have money saved in an account, which we use for food, hay, pine shavings, and equipment. The amount of money the eggs bring in far surpasses what we need for supplies, so we have the fun problem of deciding what to buy with it,” said Mr Danenbarger. The club has about 22 hens, and since each hen produces roughly one egg per day, the club usually gets close to 20 eggs per day. The demand for these eggs have been high, and sell out every week through a subscription service that is offered to faculty and staff. Nikki Decola ’19, a member of the club for several years, has noticed that the chickens have distinct personalities. If you are interested in joining the Chicken Keepers Club contact Eli Taylor.